Great Sand Cay beckons this explorer. Great Sand Cay is a tiny island nearly ten miles from Salt Cay. It literally is the last land mass in the Turks & Caicos chain. Next stop is the Dominican Republic some one hundred miles across the Silver Banks. Getting here is no easy feat, but well worth it, and I was fortunate enough recently to be able to enjoy some time on its deserted shores. Base camp will be Salt Cay. An easy thirty minute flight from Providenciales brings you to this enchanting little island, steeped in history and oozing charm. Its historic salinas, wild donkeys, friendly people, and easy way of life explain why Salt Cay is fast becoming a “must see” for many a TCI vacationer. The cessation of the salt industry in the 1960s should have been the death knell for Salt Cay. Yet although many have left over the years, the community’s hardworking spirit means that the residents (about 60 souls) have adapted to serve the tourists who now frequent the island. Whale watching is a very popular activity. I was enjoying the magnificent humpbacks that migrate through the Turks Island Passage every winter when I was first introduced to Great Sand Cay. I was on a boat operated by Salt Cay Divers. 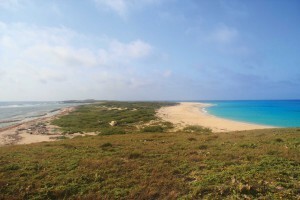 We stopped for just an hour and I vowed to return one day to explore Great Sand Cay in more detail. This time around I chartered a boat from Crystal Seas Adventures. Its proprietors made time from their busy whale watching and fishing schedule to drop me at Sand Cay for a magical trip. It’s an early start and the sun has barely risen above tiny Dean’s Dock on Salt Cay as I load my supplies of food, water, and equipment into the boat and we set off for the forty-five minute trip across an ocean that lies like glass in front of us. In no time at all we round the headland on the northern tip and although I am excited to be here, I can’t help feeling a sense of disappointment when I see six small yachts at anchor in the sheltered bay. It should come as no surprise to me, as this cay is a popular stopping off point for those sailing to and from the Dominican Republic. I almost feel cheated having to share this little spot of paradise! With all gear ashore and the Crystal Seas boat on its way back, I am relieved to see no other people on the beach—they must still be on board their floating homes. I set up a sun shade and lay out all my gear. I know even if someone from the yachts comes ashore while I am walking it will be untouched and perfectly safe—it’s the unwritten rule of fellow adventurers! I am on a beach that faces west, and it is probably the widest beach I have ever seen. This must be what gave the cay its name. I have high ground to the north and south and I set off south to explore and get my bearings. The beach is hard-going as the sand is soft and deep. I could make easier progress inland walking through the low scrub, but Sand Cay is a nature sanctuary and I want to leave as little impact as possible. I think of ground nesting birds and fauna that may be affected by my presence if I switch tracks. I soon reach the furthest tip of the cay; the entire island is only one and one-half miles long and three hundred yards wide, so it’s taken just minutes to walk to the end. The southern tip morphs into a rocky headland. Above me on the sandy limestone cliffs I spot large iguanas scuttling away, no doubt annoyed at having their sunbathing disturbed! As I clamber over the iron-shore rocks, waves crash below me and although this is rugged terrain, it is gorgeous. At the tip is a place often called “Looking Glass Rock” and I sit here a while and just enjoy the view. I work my way around to the windward side and start walking back north. Here all sorts of debris has accumulated over the years, washed up from miles away, and I pick my way through a thousand items carelessly discarded by man. I am soon back close to my start point and I climb the second hill at the north end. I had spotted some remains and these mangled structures turn out to be some sort of lighthouse. With iron beams now rust covered and lights redundant, it serves only as a look-out perch for an osprey or two. As I push over the hill I find myself overlooking a wide shallow creek. I can spot nurse sharks gliding through the calm water and a small, low headland that is actually separated from the land where I stand by a channel of rushing water just ten feet wide. I wade across to this “second” island and look back across the creek to the old lighthouse atop the hill. I can just spot a moving mast, so am grateful that at least one yacht is leaving! I start to walk back along the western coastline and have to climb the hill once more, past the old tower. As I stand here and look down at the amazing water, an osprey gives me a fly-past and I manage to get a picture as it soars past. 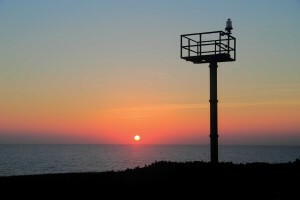 Sunset on Tower Hill, with remains of old lighthouse. As I summit the hill, I see that ALL the yachts have left! And I am rewarded with a view like no other. The entire length of Sand Cay is laid out in front of me—calm stunning water, powder-soft sand with only my footprints, and a peacefulness surrounding me that no spa on earth could ever replicate. I drop back down to the beach and my camp. I sit and look out at a vista like no other. I can just make out the mast of the last yacht slipping over the horizon and I soak up the solitude and tranquility. The sun is starting to set and I relax on the beach daydreaming about all the past visitors here and wonder too if they found it as captivating as I do. Sand Cay obviously gets a lot of passing traffic but I was told a story of a sailor who risked his job to come here . . . and not for the scenery! John Delaney, from England, had captained many vessels. The story goes that on one voyage, a crew member became ill and before dying, confessed to Delaney that he was once a pirate. An exciting story of buried treasure on a barren Turks Island followed. Some years later, Delaney told the story to his crew on the Rechab and as a result, the ship slipped out of St. John in the fall of 1850 and “fetched up” off Great Sand Cay. Here the story differs. While some say he recovered $150,000 in treasure (and even left behind $10,000 as a goodwill gesture) other documents dictate that “divining rods and shovels failed to produce anything,” they gave up and headed for home. 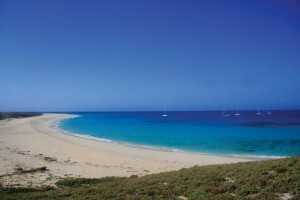 A mysterious and more recent addition to this story is one told by an elderly Salt Cay resident. When he was a young boy fishing with his father, they witnessed a barge land on Sand Cay with a bulldozer and other earth moving equipment. After some day’s activity, and just as authorities were arriving from Grand Turk to investigate, the would-be treasure hunters abandoned all their equipment on Grand Turk and left in a private plane, never to be seen again! With fading stories of swashbuckling pirates in my head, I decide to climb the hill and watch the sunset, and I am rewarded with stunning views once more. The sun dips below the horizon and the sea is dead calm. But this tranquility can be deceiving, as thousands of ships have been lost in these waters. Once away from the deep Columbus Passage, reefs and coral heads await the unsuspecting! In fact, the famous wreck of HMS Endymion lies just south of here and I have seen a chart from the mid 1700s that shows another warship wreck close by too. These are both in shallow waters, so who knows what is at the bottom of the seven thousand foot- deep passage! The sun sets and I sleep under the stars, both bug-free and care-free. After a dawn swim, I spot the Crystal Seas boat in the distance. A quick call by marine radio and I am safely on board. As we head around the point and back to Salt Cay, a passing visitor swims alongside for a few moments . . . it’s a fitting end to a priceless trip.